An Ohio man who served as a grant writer for the American Indian Education Center in Parma, Ohio, was charged yesterday with embezzling more than $183,000 from federal grants provided for Native American services by the federal Substance Abuse and Mental Health Services Administration. The AIEC, a document obtained by Cleveland.com shows, received more than $1,400,000 from SAMHSA between 2008 and 2012. 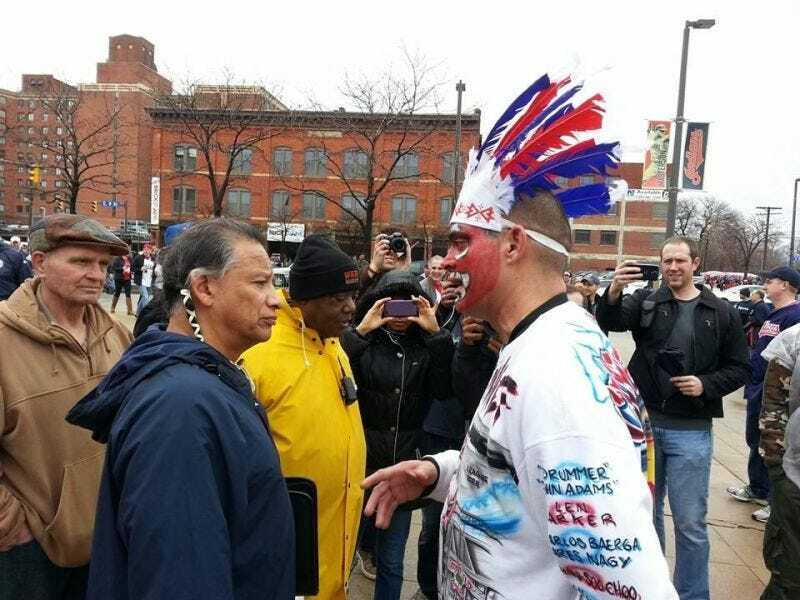 The man charged, Craig McGuire, served as a contractor for the AIEC, which is run by Robert Roche, an Chiricahua Apache man known for his efforts to get the Cleveland Indians to do away with their racist logo. If you’ve followed the opposition to the use of Native American imagery in sports logos and names, you’ve likely seen Roche in a version of the photo above, standing toe-to-toe with a non-Native man in a headdress and face paint outside of an Indians game. Roche is not charged in connection to McGuire’s alleged embezzlement. However, the charging document shows that McGuire conspired with a person with the initials “R.R.” to defraud the federal government by stealing money meant to be used toward mental health services for Native American families. McGuire is charged with three counts: One charge of conspiracy to commit theft concerning program receiving federal funds and two charges of theft of government funds. The center’s application contained numerous false statements, including a claim the center had a wellness department and a “Positive Paths” after school program when no such department or program existed, according to the charges. It fraudulently listed people the center allegedly employed and mischaracterized the description of the storefront building and physical amenities, according to the information. “R.R.” is also accused of paying himself approximately twice-monthly from the federal grant between October 2011 and March 2013. The amount changed periodically depending on money available through the grant, but reached as high as $2,648.05 twice a month in 2012. The grant money available to AIEC was not to be used for compensation.